My house has plenty of mirrors around. I love to decorate with mirrors as it gives an illusion of a larger space. Beside that, it also makes your house looks elegant. As this is the case for my house, I used to include glass cleaner in my shopping list. However, you would notice that some good brands are really expensive. Sometimes, it also becomes a burden especially if you let your house helpers do the task and has the tendency to put your cleaning solution into waste by applying too much or by simply not being mindful of the expenses as they are not the ones purchasing it anyway. 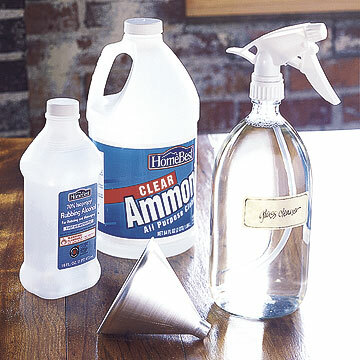 Make your own streak-free glass cleaner by mixing a solution of 2 cups water, 2 cups rubbing alcohol, and 1/2 cup ammonia. Put the mixture in a spray bottle (32 ounces or larger) and use a clean, absorbent lint-free rag (soft cotton is ideal) to wipe the glass. The ammonia does most of the cleaning and the alcohol speeds up the drying time to help eliminate streaks. You can try it too!